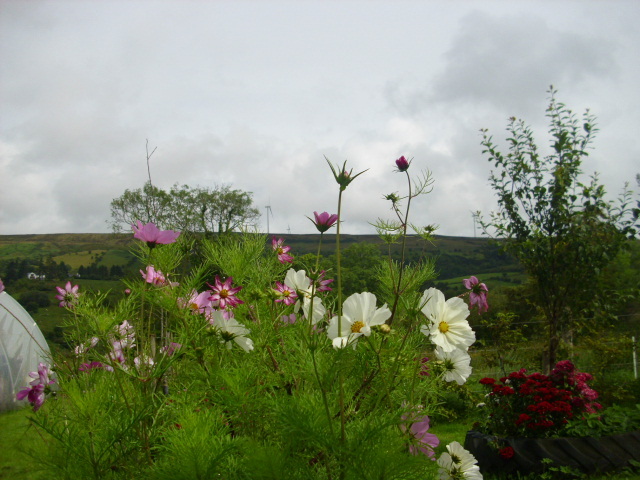 Even though this Summer has been one of the wettest, dullest and coldest ever the flowers have played a blinder. If anything they have been better than ever. I think this is partially due to the fact that as the garden matures there are more areas of shelter and windbreaks. 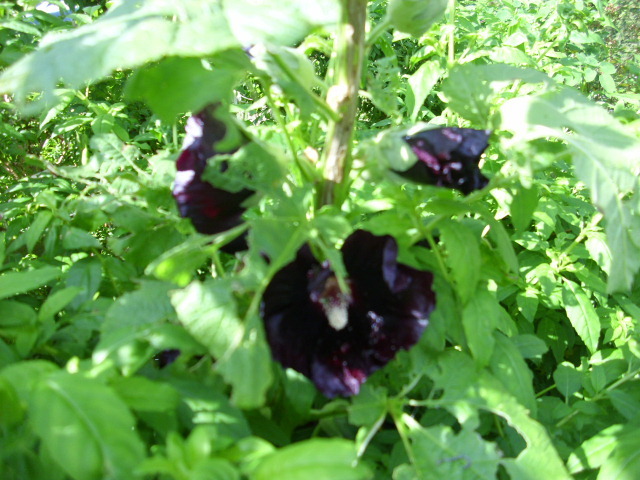 Did’nt see this lovely Hollyhock until it started to flower. Supposedly black, it is more like a very deep purple to me. Is there such a thing as a truly black flower? This one came up through a pink flowered Fuschia. Cosmos of course never fail to please. One of my faves. 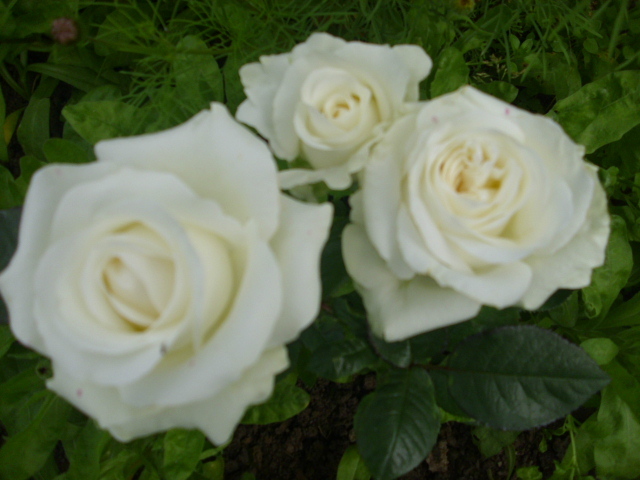 They mature fully from a Spring sowing and provided you keep them deadheaded will flower until well into Autumn. 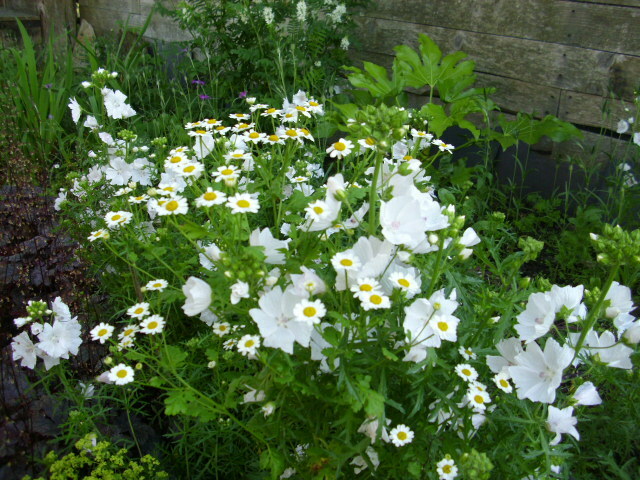 White Mallow and Feverfew in the shady border by the chalet. This border has filled out really well. It was begun in March 2011. Earlier this year we buried our dog Alice here…it was a place he liked to sit. A packet of wildflower seeds was planted and from it came mostly these beautiful Corncockle. As purple is my fave colour I really like them. 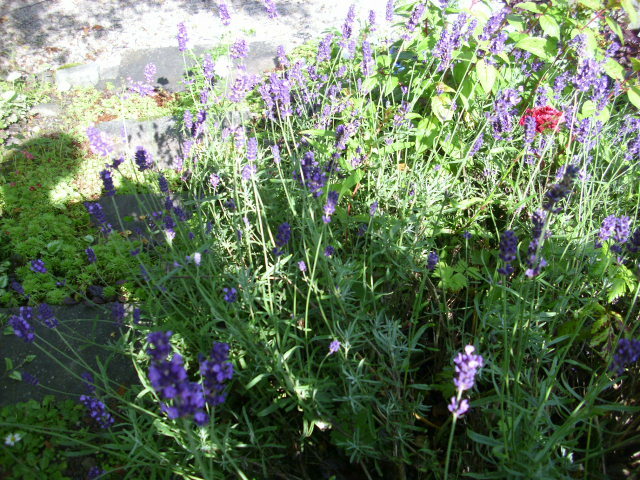 Even Lavender which likes good drainage and lots of sunshine has done ok. 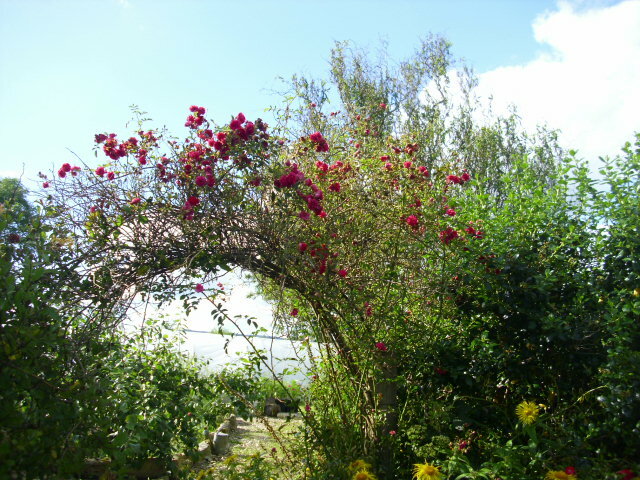 The archway above the garden gate is not as heavily clothed as other years…but not too bad either. Finally this variegated Lysmachia in dappled evening sunlight. It is doing well under the shade of the Birch tree. Random Thoughts from Prospect Cottage. 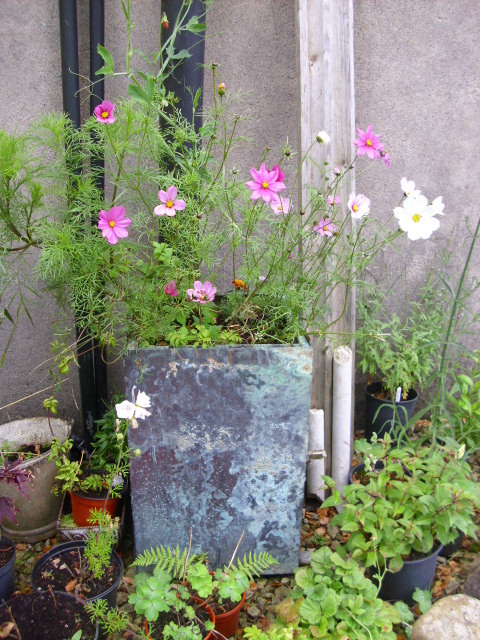 Cosmos, one of my fave flowers is still doing well here in this tub despite the wind and rain which has been battering us for a few days now. 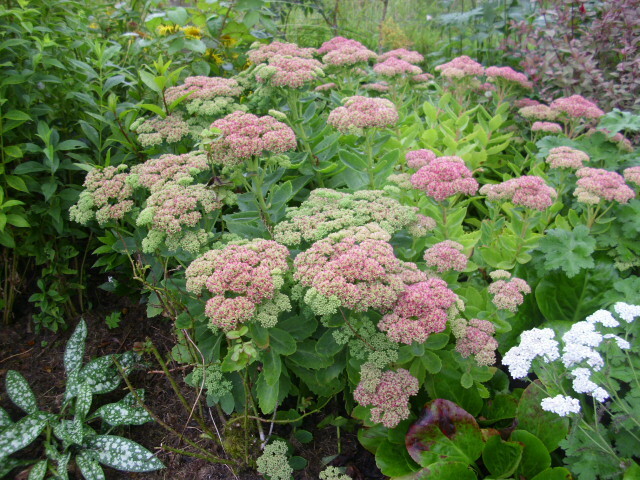 Sedums are reddening up, Autumn is here! 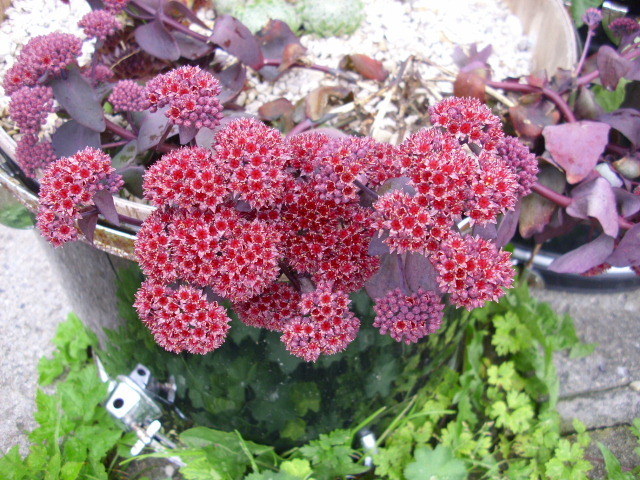 This purple Sedum which I got earlier in the Summer is already showing it’s dark red flowers. Not too many Butterflies though! 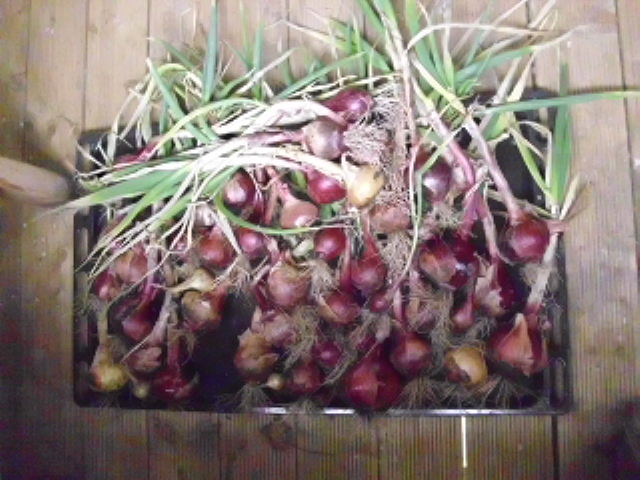 Onions are drying on the bench in the shed. They will be tied in bundles for use through the Winter months. 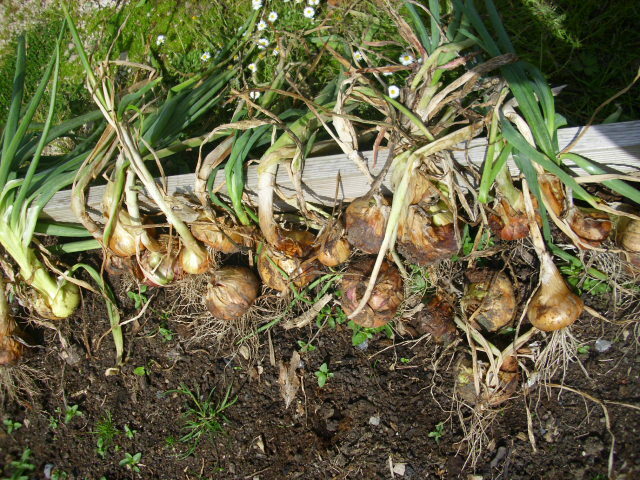 Have you ever noticed how home-grown Onions are much stronger than shop bought? Red Onions are also drying. 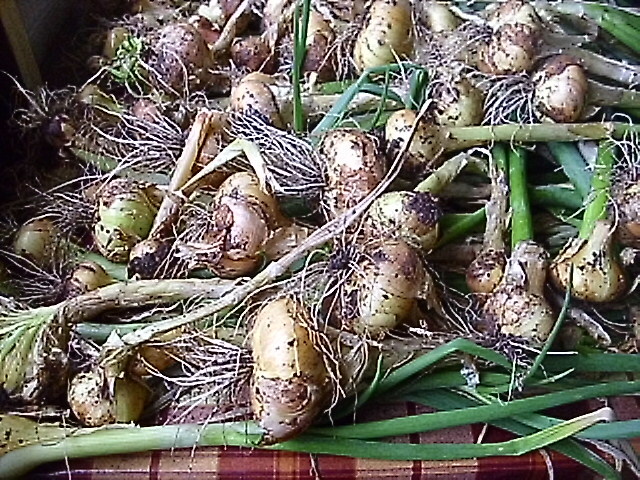 These will make a lovely Onion Marmalade or decorate a Winter salad. 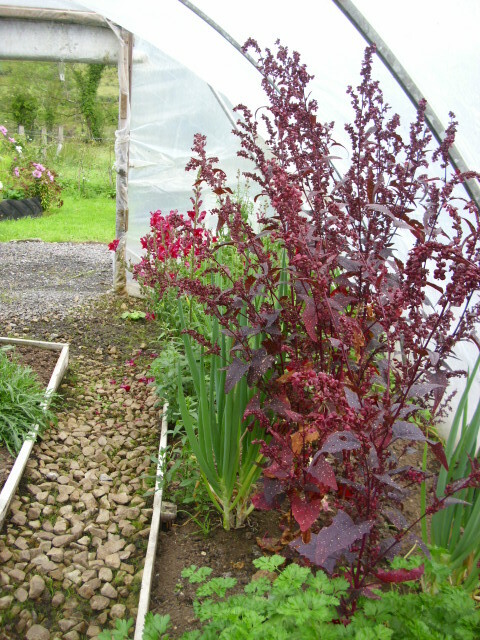 In the polytunnel Red Orach is setting seed. I shall plant this outdoors next year as it is very decorative, not so keen on it’s edible leaves. 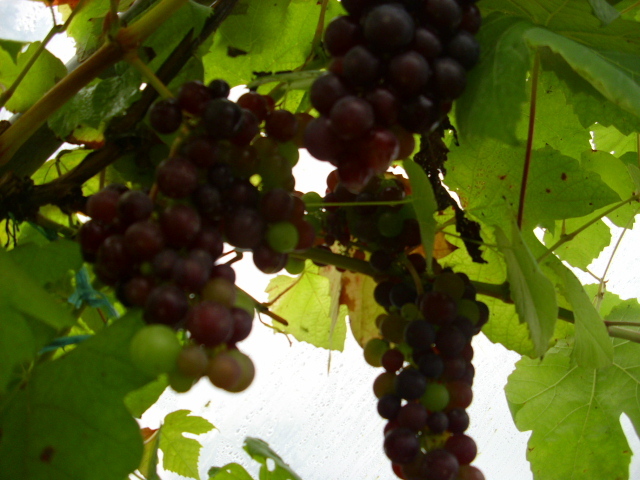 The Grapes are starting to ripen at last, very late this year. They are surprisingly sweet given the lack of sunshine. I am going to leave some to get really ripe as I plan to make wine this year. The riper they are the higher the natural sugars. Spuds and Flowers @ Prospect Cottage. Every year we grow some Potatoes in bags. 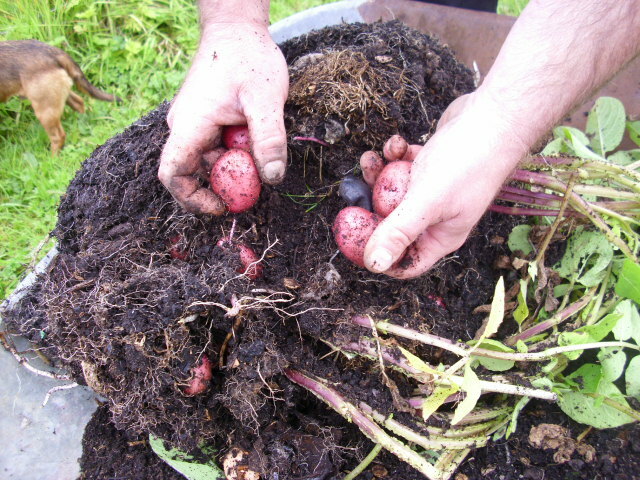 A few inches of compost in the bottom of a sack, holes in bag to allow drainage, pop in 3 or 4 Potatoes per bag, cover with compost and there you have it. The ones above are Sarpo Mira. 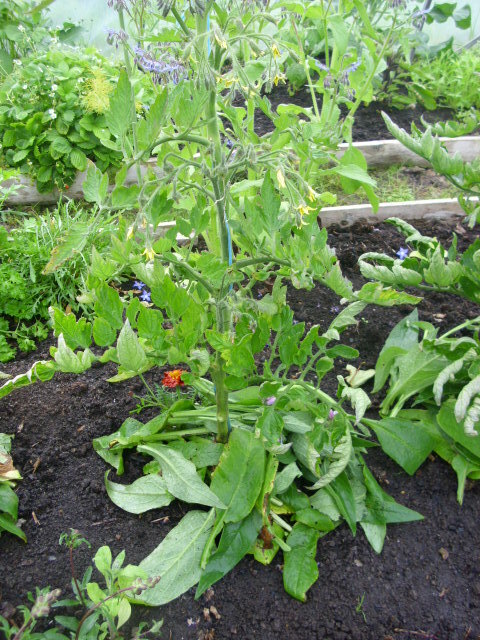 They were topped up with compost twice as they grew. 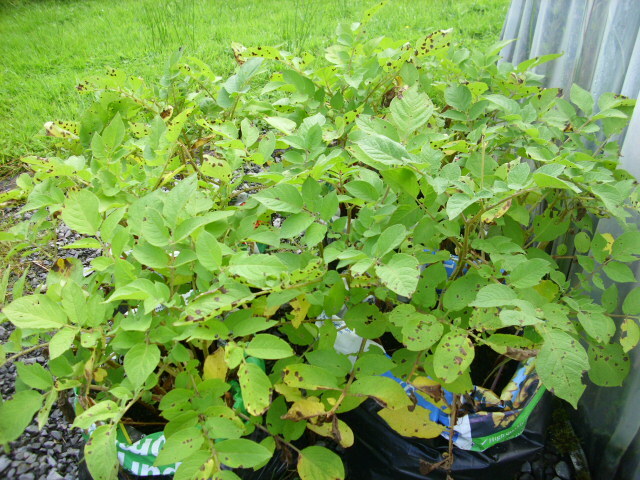 They were not treated for blight and only now are they getting some spots on leaves. 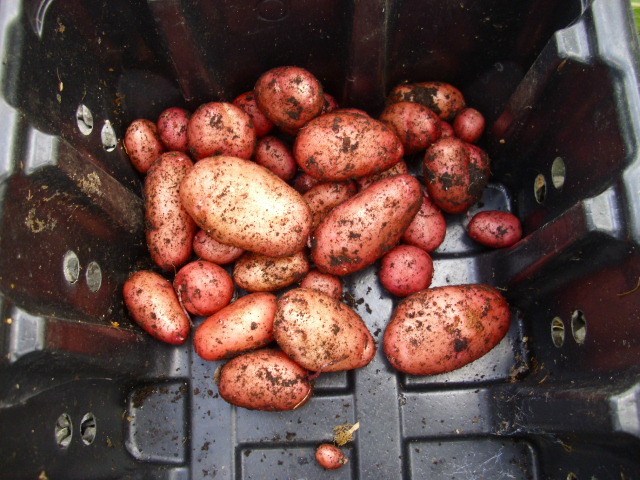 They were harvested last week and as you can see there were lots of lovely little pink potatoes to be gathered. We emptied the bags into the wheelbarrow for easy access. 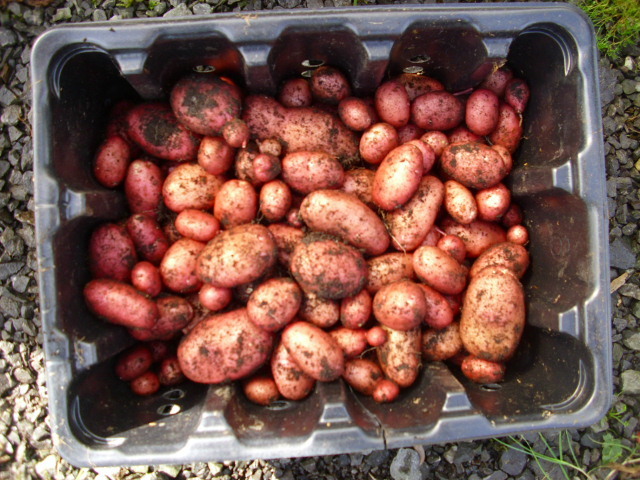 This lot is from one bag which contained 3 seed Potatoes. The Potatoes are small but I do find the bags don’t produce big Spuds. This is the total from the 4 bags, a little over 10 lbs. Not bad for very little effort, delicious little organic Potatoes from our own garden. 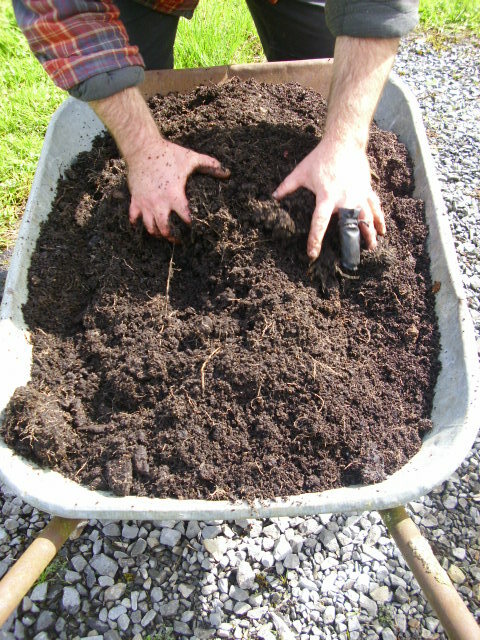 The resulting barrowload of compost was used to top up one of the veg beds. I love little garden experiments like this, it proves you can grow spuds anywhere even without a garden. 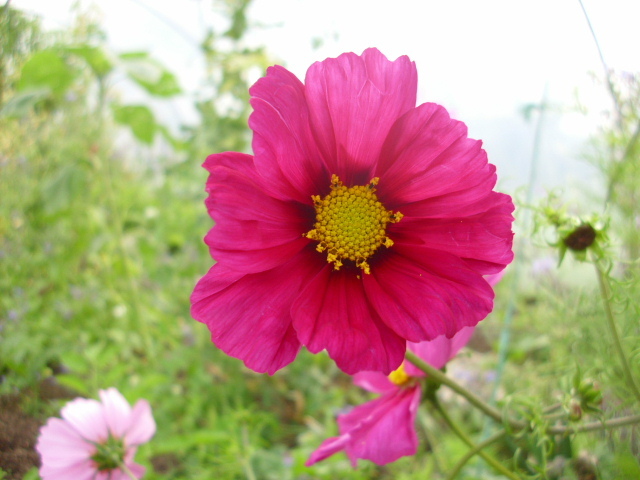 and outside the polytunnel this container of Cosmos continues to provide colour. 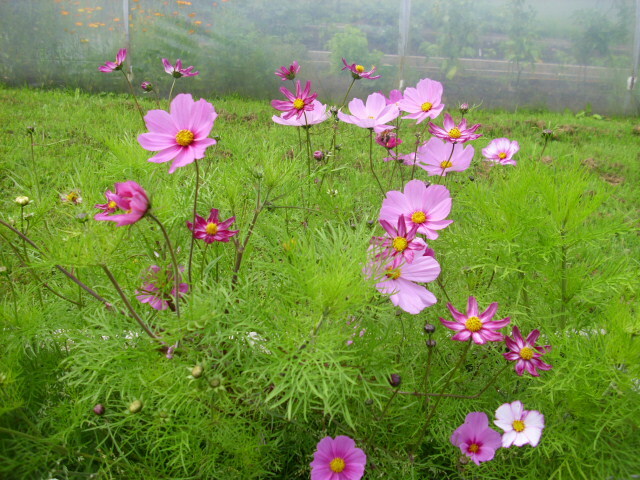 I love Cosmos and will save seeds from these for next years crop. More Summer flowers from Prospect Cottage. 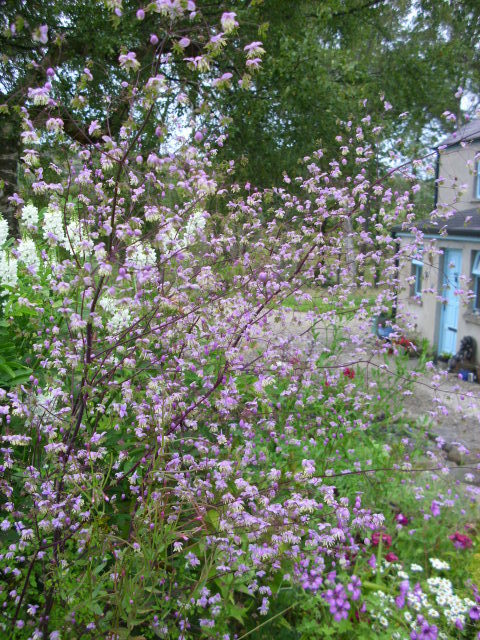 Thalictrum (Meadow Rue) adds a lovely light and airy feel to a border. Last year I saved lots of seeds and planted them in Spring, not one plant resulted. Maybe they need to be sown when fresh? 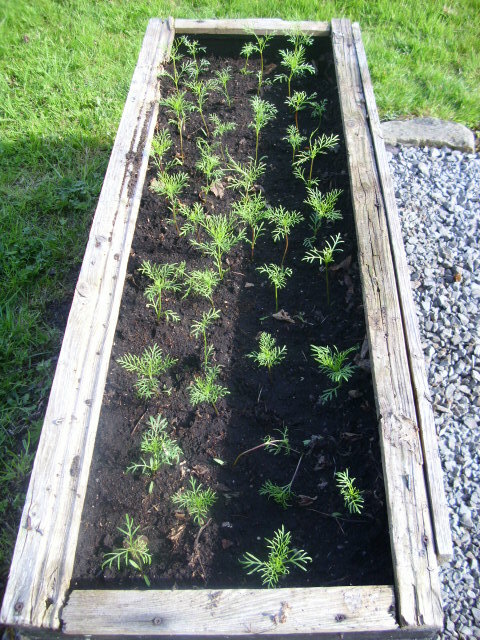 There were however lots of self-sown seedlings so I got my extra plants anyway! 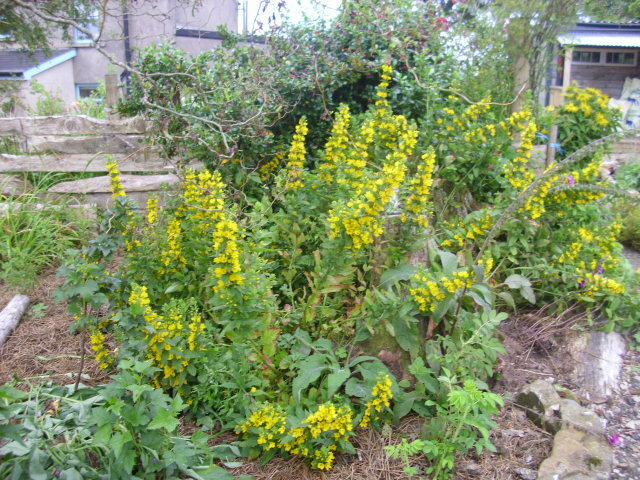 Lysimachia or Loosestrife loves a damp area and will tolerate shade. It is however a rapid spreader so be careful where you plant it. 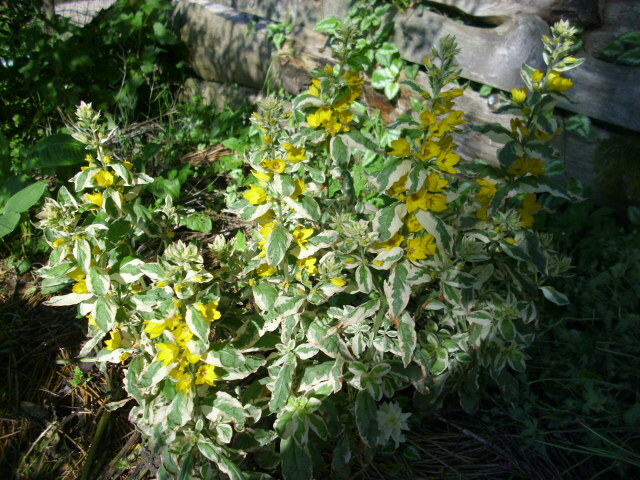 It is propogated by division of clumps in Autumn or Spring. 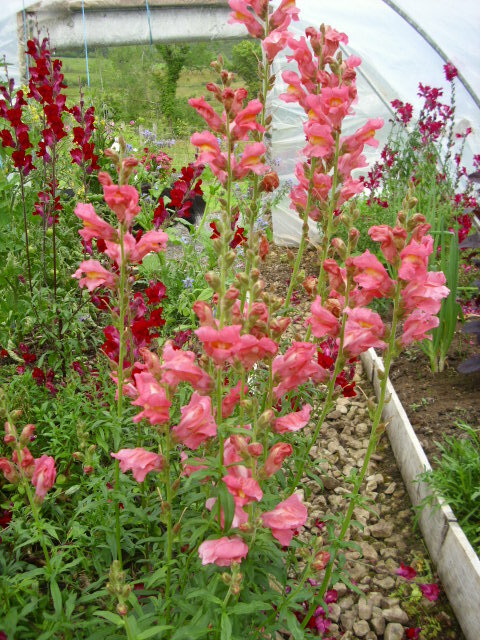 In the polytunnel Antirrhinums or Snapdragons as they are commonly known continue to do provide lots of colour. They propogate themselves from year to year. Cosmos is doing well too, I love this shade. Deadheading ensures a continuity of blooms. Towards the end of the season I will allow some seed heads to form for propogating next years flowers. Gardeners always need to think ahead. 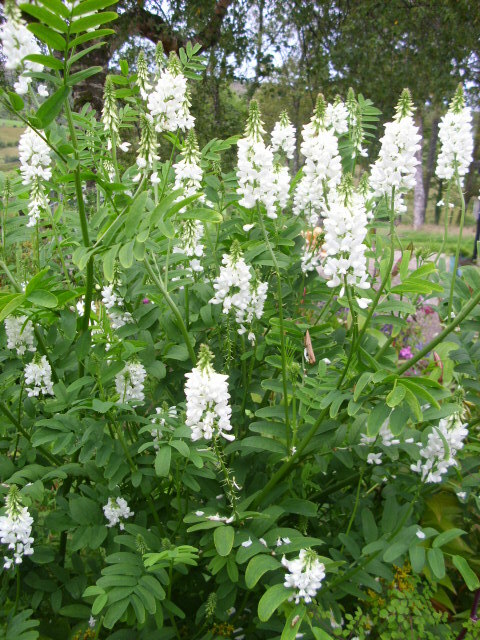 Galega officinalis “Alba” also known as Goat’s Rue or French Lilac does well in moist but well-drained soil. It isn’t fussy about siting, I have it in full sun and also in a partially shaded spot. It does well in both situations. It can be propogated by division or seed. It is on the Noxious Weed List in parts of America because of its rapid spread, I have not found it to be such a rampant spreader here. 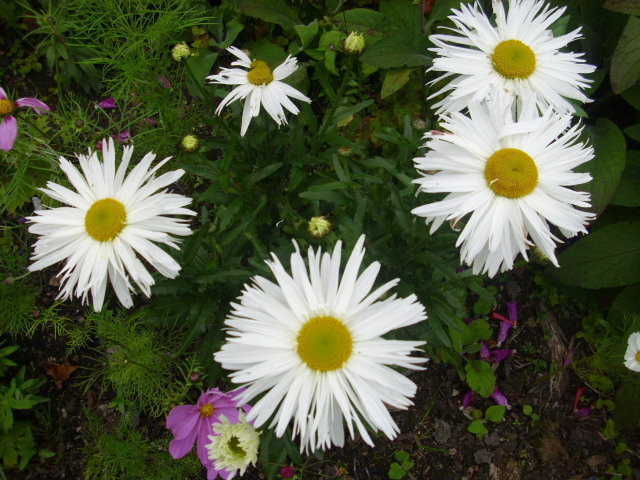 Shasta Daisy, another perennial which does well in our area. 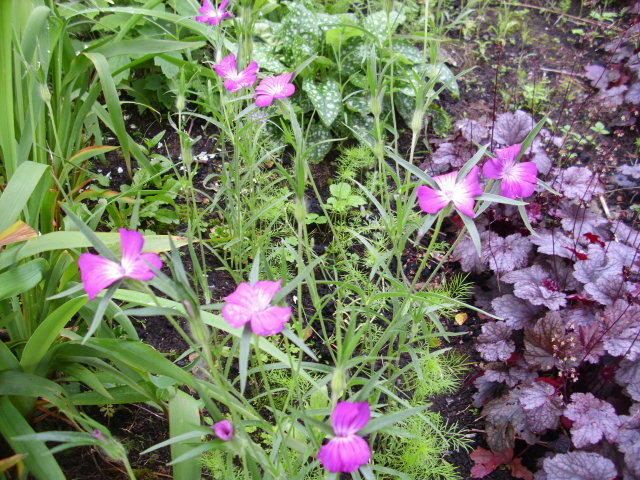 It has a long flowering period and it too divides well to provide extra plants. 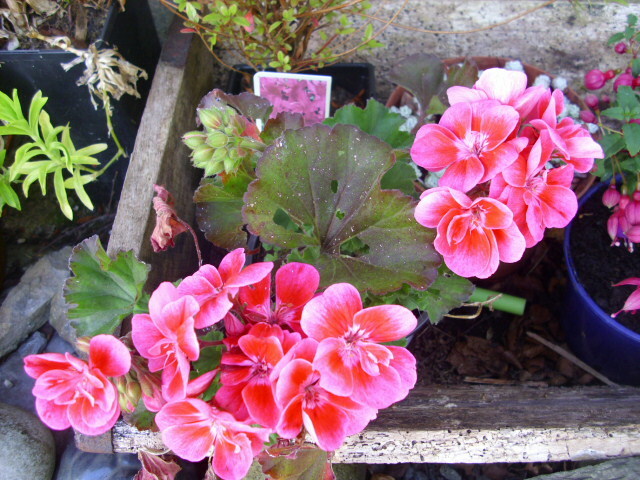 It is very hardy which is useful considering our increasingly colder Winters in Ireland. In flower @ Prospect Cottage. 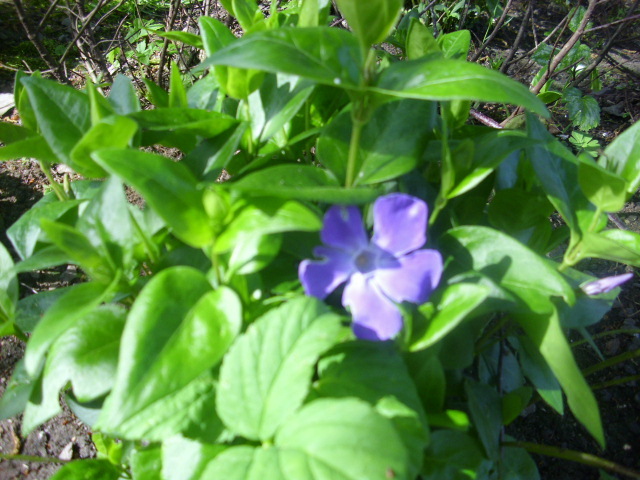 Vinca major or Periwinkle as it is more commonly known is just showing it’s first flowers now. 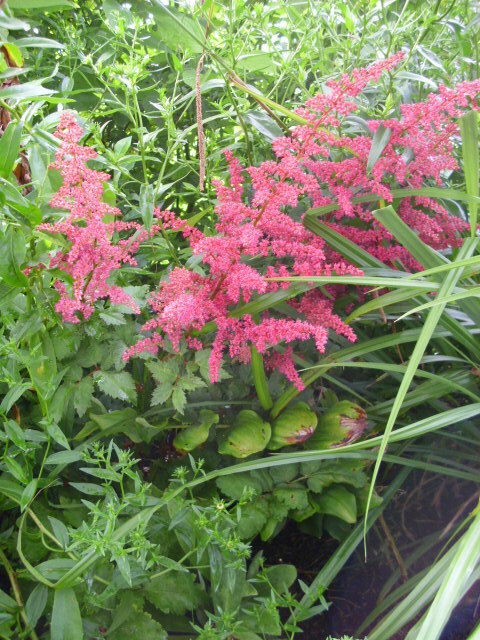 It is an old cottage garden favourite, it’s great asset is that it does well in shady areas. An old name for Periwinkle was sorcerer’s violet, at one time it was used in love charms and was believed to have the power to get rid of evil spirits. It was also made into an ointment used to treat skin inflammmations. 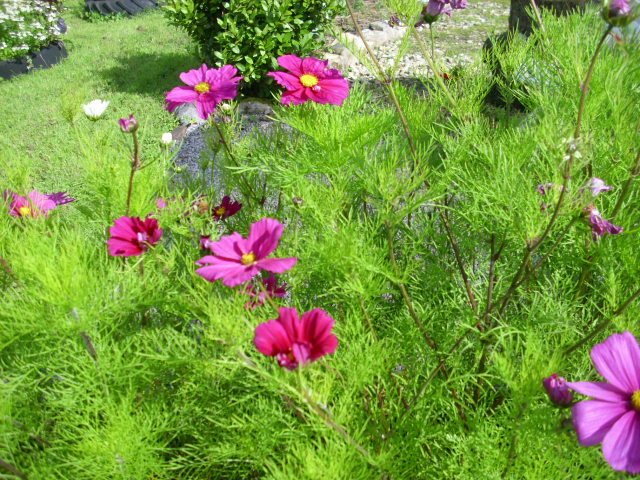 Cosmos are one of my fave garden flowers. I planted a full packet of seeds earlier in the Spring and they have come on well. Yesterday I planted a full trough of them, multicoloured variety. 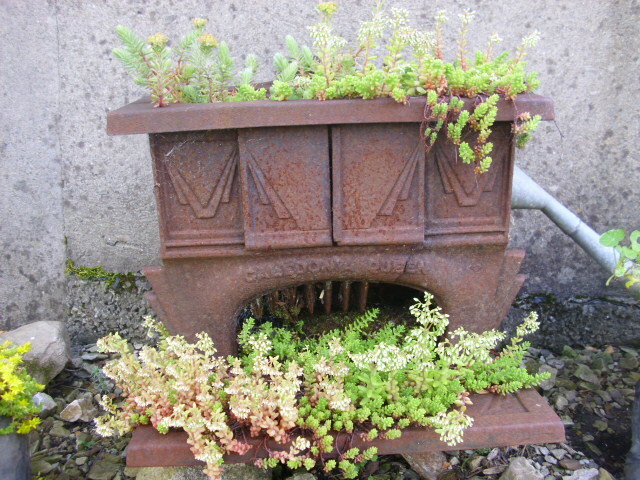 This trough was an old one from someone’s attic given a new lease of life in the garden. 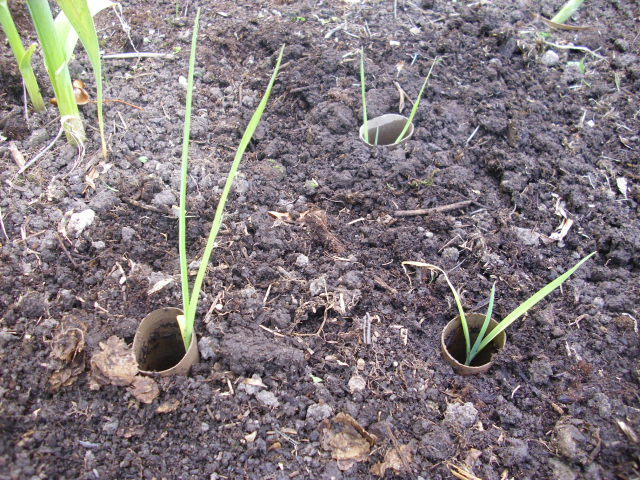 Last year it held Strawberries, they have been moved into the polytunnel to give some earlies. 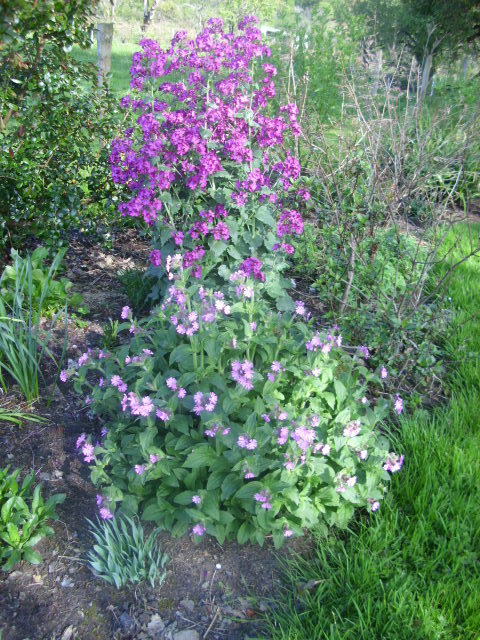 The fab weather at the moment is bringing lots of plants into early flower although I think the Campion and Honesty pictured above are actually in season. Their colour matchedness is purely accidental. I just plant without worrying about coordination, somehow it still manages to look fine, you can’t mismatch nature! 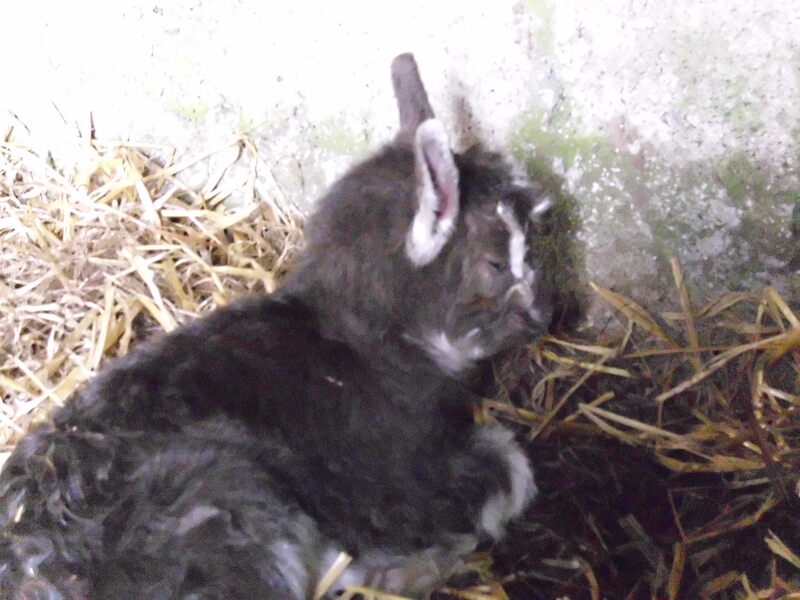 This is Bella a few hours after she was born last year, so cute. Check yesterday’s post to see her now, still a cutie!